Dr. Kevin Coughlin (center), with Craig Sweitzer (right) and Sweitzer’s son, Michael, says a welcoming dental environment and state-of-the-art technology are both important elements in a dental practice’s design. Craig Sweitzer’s company has built more than 75 medical and dental practices over the past 30 years. The first of those clients — Baystate Dental — is also the most recent. 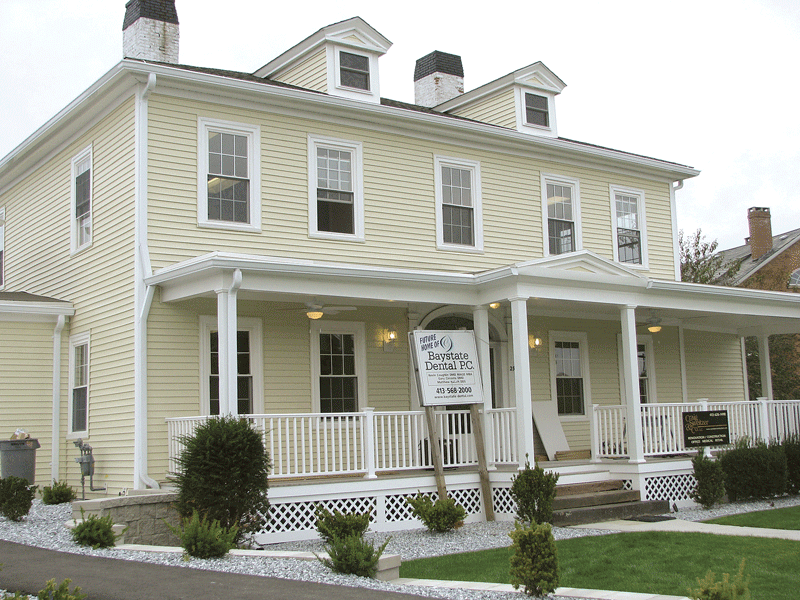 BusinessWest recently sat down with both Sweitzer and Dr. Kevin Coughlin, owner of Baystate Dental, at the practice’s 10th location, which opened last week in a restored house in downtown Westfield. 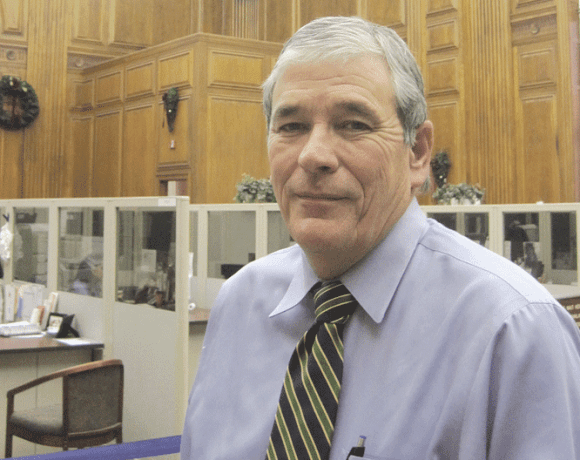 Craig Sweitzer & Co. has built the last nine of those offices, with two more planned for the near future, and the two men have shared what they call a rewarding professional partnership over the past three decades. The story begins in 1983, when Coughlin was getting ready to take over Baystate Dental from its founders, Drs. Gabriel and Milton Auerbach. “As they retired, I felt it was necessary to renovate and expand, and I knew what I wanted to do — I just didn’t know how it could be done and who could help me do that,” Coughlin said. At the time, Baystate Dental operated at just one site, on Main Street in Springfield. He was introduced by a mutual friend to Sweitzer, who was in a similar position — that of wanting to broaden his business beyond residential projects and professional buildings. Coughlin jokes that he might not have hired Sweitzer if he had realized just now inexperienced the builder was in the medical-dental field, but he’s glad he had no misgivings at the time. “I immediately liked him, trusted him, and believed in him,” Coughlin said. “He set out with plans and designs to renovate that initial practice, with the goal that we wanted to give our patients not just a warm and wonderful atmosphere, but efficient, effective, state-of-the-art care in that welcoming atmosphere. The history of Baystate Dental is the recent history of two families. When Joyce Mercadante was growing up in Agawam, her family befriended the Auerbach family; later, two of the Auerbach children, Gabriel and Milton, would go on to become dentists, and the Mercandante family became early patients of the new practice in Springfield. Mercadante later married Ralph Coughlin and had two sons, whom the Auerbachs encouraged to enter the field of dentistry. After part-time and summer work in the Baystate Dental lab during high school and college, Kevin enrolled in the dental program at Tufts University School of Medicine. He returned to the region and the Auerbachs’ practice, gradually broadening his responsibilities, helping the practice expand into evening and Saturday hours. After Coughlin took over the practice in 1983, he embarked on an ambitious expansion plan and, in 2003, added two partners in Drs. Gary Circosta and Matthew Haluch. The practice now employs 120 staff members, including 18 dentists, at its 10 locations, making it the largest private dental practice in the state. Sweitzer’s emergence in the construction field started equally humbly. “I actually owned a furniture business before I graduated college — designing, building, and selling furniture in East Longmeadow,” he told BusinessWest. After that, he went to work for a general contractor for a couple of years before setting out on his own with small projects, mostly kitchens and bathrooms. The new Westfield office is the first Baystate Dental practice to occupy a remodeled house. 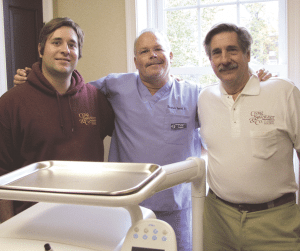 His long-standing professional relationship with Coughlin has included building new dental facilities in Springfield, Belchertown, Chicopee, East Longmeadow, Longmeadow, Ludlow, West Springfield, Westfield, and Wilbraham. Baystate Dental’s other long-time partner is Patterson Dental, a national resource for equipment, supplies, and expertise in industry trends. For example, at the new Westfield office, Sweitzer became concerned about the way the ceiling tiles in the operatories, or procedure rooms, reflected sound. Feeling that it created too loud an environment, he researched materials and softened the noise. Coughlin said the dental public demands much more than it used to, both in technology and a pleasant practice environment. Likewise, Baystate Dental has strived to do almost anything to get treatment to patients, providing services at home for non-ambulatory individuals and offering a broad range of sedation options even for routine treatments. But both Coughlin and Sweitzer couldn’t help but come back to the design of the new Westfield office — the first Baystate Dental practice in a renovated house, not a new building. That wasn’t the original plan; the project was originally drawn up and approved as a new, three-story, 30,000-square-foot building with a footprint extending very close to Broad Street. But they decided a remodel of the original building was sufficient for the practice’s needs and blended much better with Westfield’s reconstructed downtown. “Everyone who goes by here, they love it,” Sweitzer said. Added Coughlin, “I don’t think this detracts at all from the center of Westfield, and I think it actually adds to it. People know we could have done something else, but we took what I like to think is the higher ground. Indeed, while state-of-the-art technology is critical, after 30 years and 10 offices — with more on the way — Coughlin doesn’t underestimate the power of a welcoming atmosphere. As befits their mutually beneficial relationship, he and Sweitzer are happy to share the credit.